The gain of function experiments in which avian influenza H5N1 virus was provided the ability to transmit by aerosol among ferrets were met with substantial outrage from both the press and even some scientists; scenarios of lethal viruses escaping from the laboratory and killing millions proliferated (see examples here and here). The recent publication of new influenza virus gain of function studies from the laboratories of Kawaoka and Perez have unleashed another barrage of criticism. What exactly was done and what does it mean? According to critics, virologists should not be entrusted to carry out gain of function studies with influenza virus; they are dangerous and of no scientific value. The headline of a Guardian article is “Scientists condemn ‘crazy, dangerous’ creation of deadly airborne flu virus” (the headline is at best misleading because the influenza virus that was reconstructed by Kawaoka and colleagues is not deadly when transmitted by aerosol). The main opponents of the work appear to be Lord May*, former President of the Royal Society; Harvard epidemiologist Mark Lipsitch; and virologist Simon Wain Hobson. They all have nasty things to say about the work and the people doing it. To his credit, author of the Guardian article Ian Sample (who likely did not write the headline) does present both sides of the study, and attempts to explain what was done. He even quotes Kawaoka on the value of the work. But much is left unsaid, and without a detailed analysis of the study, its importance is not readily apparent. The work by Kawaoka and colleagues attempts to answer the question of whether an influenza virus similar to that which killed 50 million people in 1918 could emerge today. First they identified in the avian influenza virus sequence database individual RNA segments that encode proteins that are very similar to the 1918 viral proteins. Next, an infectious influenza virus was produced with 8 RNA segments that encode proteins highly related to those of the 1918 virus. Each RNA segment originates from a different avian influenza virus, and differs by 8 (PB2), 6 (PB1), 20 (PB1-F2), 9 (PA), 7 (NP), 33 (HA), 31 (NA), 1 (M1), 5 (M2), 4 (NS1), and 0 (NS2) amino acids from the 1918 virus. The 1918-like avian influenza virus was less pathogenic in mice and ferrets compared with the 1918 virus, and more pathogenic than a duck influenza virus isolated in 1976. Virulence in ferrets increased when the HA or PB2 genes of the 1918-like avian influenza virus were substituted with those from the 1918 virus. Aerosol transmission among ferrets was determined for the 1918-like avian influenza virus, and reassortants containing 1918 viral genes (these experiments are done by housing infected and uninfected ferrets in neighboring cages). 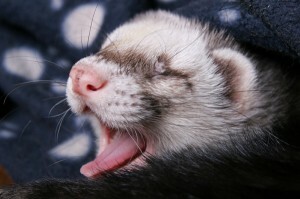 The 1918 influenza virus was transmitted to 2 of 3 ferrets. Neither the 1918-like avian influenza virus, nor the 1976 duck influenza virus transmitted among ferrets. Aerosol transmission among ferrets was observed after infection with two different reassortant viruses of the 1918-avian like influenza virus: one which possesses the 1918 virus PB2, HA, and NA RNAs (1918 PB2:HA:NA/Avian), and one which possesses the 1918 virus PA, PB1, PB2, NP, and HA genes (1918(3P+NP):HA/Avian). It is known from previous work that amino acid changes in the viral HA and PB2 proteins are important in allowing avian influenza viruses to infect humans. Changes in the viral HA glycoprotein (HA190D/225D) shift receptor specificity from avian to human sialic acids, while a change at amino acid 627 of the PB2 protein to a lysine (627K) allows avian influenza viruses to efficiently replicate in mammalian cells, and at the lower temperatures of the human upper respiratory tract. These changes were introduced into the genome of the 1918-like avian influenza virus. One of three contact ferrets was infected with 1918-like avian PB2-627K:HA-89ED/190D/225D virus (a mixture of glutamic acid and aspartic acid at amino acid 89 was introduced during propagation of the virus in cell culture). Virus recovered from this animal had three additional mutations: its genotype is 1918-like avian PB2-627K/684D:HA-89ED/113SN/190D/225D/265DV:PA-253M (there are mixtures of amino acids at HA89, 113, and 265). This virus was more virulent in ferrets and transmitted by aerosol more efficiently than the 1918-like avian influenza virus. The virus recovered from contact ferrets contained yet another amino acid change, a T-to-I mutation at position 232 of NP. Therefore ten amino acid changes are associated with allowing the 1918-like avian influenza virus to transmit by aerosol among ferrets. Aerosol transmission of these viruses is not associated with lethal disease in ferrets. Previous studies have shown that changes in the HA needed for binding to human sialic acid receptors reduced the stability of the HA protein. Adaptation of these viruses to aerosol transmission among ferrets required amino acid changes in the HA that restore its stability. Similar results were obtained in this study of the 1918-like avian influenza virus, namely, that changes that allow binding to human receptors (HA-190D/225D) destabilize the HA protein, and changes associated with aerosol transmission (HA-89D and HA- 89D/113N) restore stability. The ability of current influenza virus vaccines and antivirals to block replication with ferret transmissible versions of the 1918-like avian influenza virus was determined. Sera from humans immunized with the 2009 pandemic H1N1 strain poorly neutralized the virus, indicating that this vaccine would likely not be protective if a similar virus were to emerge. However replication of the ferret transmissible 1918-like avian influenza virus is inhibited by the antiviral drug oseltamivir. Examination of influenza virus sequence databases reveals that avian viruses encoding PB2, PB1, NP, M, and NS genes of closest similarity to those of the 1918-like avian virus have circulated largely in North America and Europe. The PB2-627K change is present in 168 of 4,293 avian PB2 genes (4%), and the HA-190D change is in 9 of 266 avian H1 HA sequences (3%), and one also had HA-225D. An infectious 1918-like avian virus can be assembled from RNA segments from circulating viruses that is of intermediate virulence in ferrets. Ten amino acid changes are sufficient to allow this virus to transmit by aerosol among ferrets. Confirmation that transmissibility of influenza virus among ferrets depends on a stable HA glycoprotein. This result was a surprising outcome of the initial studies on aerosol transmission of H5N1 avian influenza viruses among ferrets, and provided mechanistic information about what is important for transmission. Experiments can now be designed to determine if HA stability is also important for influenza virus transmission in humans. We understand little about why some viruses transmit well by aerosol while others do not. Transmission should be a selectable trait – the virus with a random mutation can reach another host by aerosol, where it replicates and can transmit further. Why types of mutation allow better transmission? Why don’t avian influenza viruses become transmissible among humans more frequently? Are there fitness tradeoffs to becoming transmissible? These and similar questions about transmission can be answered with sutdies of the types discussed here. The list is not confined to influenza virus: aerosol transmission of measles virus, rhinovirus, adenovirus, and many others, is poorly understood. This work shows what can be done and will surely inspire similar work with other viruses. Do these experiments constitute an unacceptable risk to humans? Whether or not the 1918-like avian influenza virus, or its transmissible derivatives, would replicate, transmit, and cause disease in humans is unknown. While ferrets are a good model for influenza virus pathogenesis, they cannot be used to predict what will occur in humans. Nevertheless it is prudent to work with these avian influenza viruses under appropriate containment, and that is how this work was done. The risk is worth taking, not only because understanding transmission is fundamentally important, but also because of unanticipated results which often substantially advance the field. The Guardian quotes Lipsitch as saying that “Scientists should not take such risks without strong evidence that the work could save lives, which this paper does not provide”. The value of science cannot only be judged in terms of helping human health, no matter what the risk. If we only did work to improve human health, we would not have most of the advances in science that we have today. One example is the biotechnology industry, and the recombinant DNA revolution, which emerged from the crucial discovery of restriction enzymes in bacteria – work that was not propelled by an interest in saving lives. The results obtained from the study of the reconstruction of a 1918-like avian influenza virus are important experiments whose value is clear. They are not without risk, but the risk can be mitigated. It serves no useful purpose to rail against influenza virus gain of function experiments, especially without discussing the work and its significance. I urge detractors of this type of work to carefully review the experiments and what they mean in the larger context of influenza virus pathogenesis. I understand that the papers are complex and might not be easily understood by those without scientific training, and that is why I have tried to explain these experiments as they are published (examples here and here). In the next post, I’ll explain the gain of function experiments recently published by the Perez laboratory. *May’s objection is that the scientists carrying out the work are ‘grossly ambitious people’. All scientists are ambitious, but that is not what drives Kawaoka and Perez to do this work. I suggest that Lord May read the papers and base his criticism on the science. I am by no means an expert on Influenza, I am only a PhD student working on some aspects of the immune response by using Influenza as a tool. Unfortunately I do expect some people without scientific training to panic when they read pieces in the news like the one in the guardian that you referred to, but when I see such comments from a person like Lord May, I feed disappointed, how could such a person not recognize what a PhD student could easily realize only thorough looking at the published scientific work, that it’s not so dramatic and dangerous as he claims! Your writing here suggests that you agree with the risk assessment put forward by the detracting scientists that this kind of experentation puts millions of peoples lives at risk. You state only that you believe this risk is “worth taking”. Very revealing of your value system. I am big fan of your blog, but I must say I am slightly disappointed in this post. As someone who is intimately involved in influenza transmission studies, my biggest criticism is that this 1918-reconstruction study does not tell us anything we didn’t already know. Work done by Jeff Taubenberger, Terry Tumpey, and Peter Palese on the original reconstructed 1918 virus and the proposed avian precursor, AV18, already defined the properties required for the pathogenesis and transmission of this virus in animal models. Some additional data is provided in this study including the role of PB2 and other changes in HA that might promote transmission, but these observations do not warrant a publication in Cell Host and Microbe. I understand you are trying to mitigate the fear prevalent in the greater population regarding these types of studies, and I appreciate you taking on the role to explain the nuances of behind these types of studies. However, as scientists I don’t think we should ignore whether the research pushes the field forward. In my humble opinion, this study does not do that. I have different opinions on the Perez’s H7N1 paper since that is a novel virus and the factors that promote its aerosol transmission between ferrets are important to define for comparison to other avian viruses. In the evolutionary sense, a success virus must be less lethal, less pathogenically, fewer host immune response induced, border host range, easier to spread, to enjoy high population density, to survive. This is a ridiculous question….of course, it MIGHT! Influenza Type A H1N1 viruses continue to circulate, and all sorts of things may happen. However, it is arrogant to suppose that we can predict the genome of the next pandemic strain, or how it might emerge. Kawaoka’s research is dangerous and useless in terms of responding to outbreaks of infectious disease (I have 30 years of experience in the field, was with one of the first groups to respond to HIV AIDS, and take this very seriously). Oh, by the way, they just found vials of potentially viable variola virus in Bethesda…. I find it curious that this blog hasn’t reported on the latest news = the White House has acted to restrict funding for Gain of Function experiments, and Dr. Kawaoka has agreed to cooperate. “Yoshihiro Kawaoka, a virologist at the University of Wisconsin-Madison whose lab has done studies with influenza, told NPR by email that he would initiate no new projects and would consult with NIH officials on projects that have experiments underway. “I hope there will be an eventual resolution of the issues that surround research that is important to protecting public health and advancing influenza virus research,” Kawaoka wrote, adding that he would participate in the upcoming NSABB meeting and looked forward to constructive discussions.